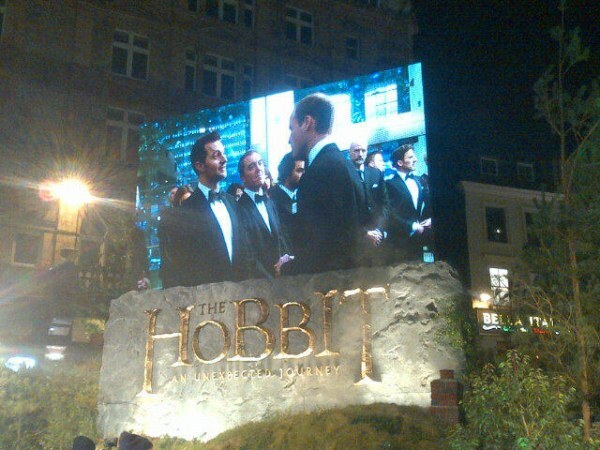 Prince William joined the stars of The Hobbit: An Unexpected Journey on the green carpet Wednesday night for the movie's UK première in London's Leicester Square. William was met by the cinema's general manager Tessa Street who later revealed he told her Kate "would have loved to have been there." 'It's really exciting to have his support. I was a bit nervous being on my own to meet him but he was very friendly. I passed on my best wishes to Kate and he said 'She would have loved to have been here if she could'. I said to William 'thank you for taking the time to come and be here tonight' because I'm sure he wants to be at home making sure Kate's okay'. William met with members of the cast and crew at the première. Sir Ian McKellan sent his best wishes to Kate before the movie began, prompting an enthusiastic round of applause from the audience. The Hobbit is the story that introduced us to Bilbo Baggins and follows his journey to the Lonely Mountain with a vigorous group of Dwarves to reclaim a treasure stolen from them by the dragon Smaug. Those of you who are fans of The Lord of the Rings will no doubt be looking forward to this one. I cannot wait to see it myself. 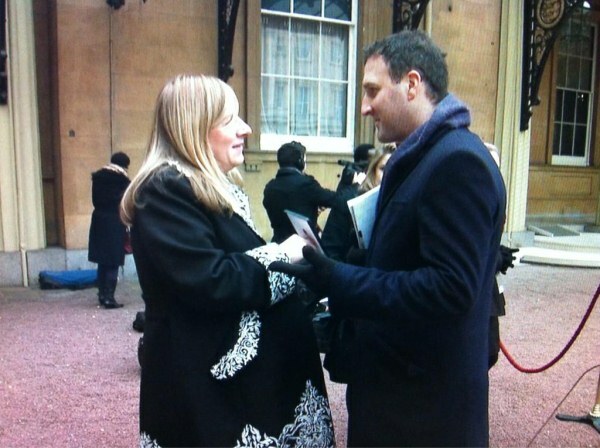 Alexander McQueen creative director Sarah Burton who designed the Duchess' wedding dress was made an Officer of the British Empire for her services to British fashion during an investiture ceremony at Buckingham Palace today after being named in The Queen's 2012 Birthday Honour's List. The Cheshire-born designer is currently pregnant with twins and when asked if she planned to design maternity wear for the Duchess she laughed and said: "I'd love to to, I hope I will be." Sarah also revealed that Kate's wedding dress is her favourite creation for Kate and working with her is "a lot of fun, an absolute pleasure." A very well deserved OBE. Sarah Burton's pieces look incredible on Kate. One of my favourite's is the black velvet strapless gown Kate wore to the Sun Military Awards last December. Royal contributor Victoria Arbiter shared news via Twitter that St James's Palace won't specify when William is returning to Anglesey, but he does have flying shifts scheduled between now and Christmas. It would seem rather likely he will be returning very shortly. The Palace also said Kate will divide her time between London, Bucklebury and Anglesey as she always does. Thank you Charlotte for this great up date. I am sad that William has to return to his duties but I am sure he will make sure that his Duchess is well looked after. And I hope she is feeling better so she can go home to Anglesey to spend time with William. I can not imgine not being with my husband during this exciting time. Being able to watch our baby grow together. And I don't think we will see the Duchess much at all during the first several months of her pregnancy. And I don't think we will get to see her & William at Christmas either. I have heard they will be spending it with the Duchess's parents so the media will not be able to get any photos. But as much as I would love to see them together, it is better that they get their privacy. is deserting his wife when she needs him most. I think it might be the other way around, the perception that he is neglecting his duty to care for his wife. Every other pregnant spouse has to deal with work demands, her own and the husband's. It would be an exceptionally unusual job in the States that would give someone time off for the wife's pregnancy ailments. I wish all three of them the very best. Anonymous @8:06. William is a full time officer with SAR. This illness of Catherine's is NOT grounds for compassionate leave, IMO. He is part of a team, and a team that has families, wives, children etc. He would choose, I think, to be given preferential treatment. I think he has to walk a difficult line in order to do something practical and worthwhile (SAR) whilst he is only 2nd in line to the throne and the royal duties that requires. @CP- I disagree with you CP. I researched the RAF at their website and William is not getting special treatment. It states on their site that basically any member who's family has an illness or died is entitled to compassionate leave. And it is up to 4 weeks and possible more if needed. We have to remember that the Duchess was admitted to the hospital & spent 3 nights in there. And has had a relapse. @Carolbee- William is not neglecting his duties. Sinc ehe is a member of the RAF he is entitled to compassionate leave to take care of his wife. This also goes for any service member here in the states. I have had friends who's husbands have been in the US military and they fell ill during a pregancny and was given leave. Also in the states there is something called Famliy Medical Leave Act. This is an unpaid leave for up to 12 weeks without pay. California has something like the federal program but you get paid for 6 weeks. @Anonymous- I don't think William is deserting his wife. He has had time off to take care of her and now he has to go back to work. I think it will be very hard on him (and her) to go back to work but they knew this was going to happen at some point. William will make sure she is lefted in good hands before he leaves. And he will be back to her on his days off. I just hope she get's well soon. Surprisingly, the Court Circular on the British Monarchy site records that Prince William did attend the Military Tournament on Sunday. i wish she could have gone but im so glad she's getting the rest. she must be so happy to be out of the public eye and to just be herself and relax and enjoy pregnancy sickness and all. I sure hope she is feeling better asap! i wish wills could cancel all engagements and stay by her side. Relax and enjoy her pregnancy sickness?! Surely you misspoke. "Pregnancy sickness" feels a lot like the nausea and vomiting of "chemotherapy sickness"--except that it lasts longer, and the pregnant woman cannot take the powerful antinausea drugs often prescribed for cancer patients. Granted, the prognosis for the pregnant woman is a lot happier than for the cancer patient, but that is not enough to combat the immediacy of the unrelenting sickness. Very odd that in the US, Lifetime had an hour pregnancy special on the royal baby, risky as there is not yet a due date. Also, the court circular is released in advance. Many editors then publish without making updates, as the royals rarely cancel. I don't think it matters where the duchess spends time. They are to conscientious to put her at any risk. It is good to know she is getting adequate support and rest. Hopefully she will be feeling better and able to nest. Merry Christmas to you, Charlotte. I hope after the holidays you'll have time to continue your presentation of Kate's Coats. They fill me with serious coat envy--even though it's rarely cold enough even to wear a coat in Georgia USA! Wishing your family a very Merry Christmas too! Thank you Lynn. I anticipate we won't see much of the Duchess in the coming months but all that matters is mother and baby are well. I completely agree with you Charlotte. I never thought I would say this, but I'd rather not see the Duchess for a while! She needs rest and needs to be away from the media. Thank you again for a great post, Charlotte. Of course we all miss seeing Kate but I know we all want her to rest and get better. We have many beautiful christening photos to look forward too! I have many posts planned for the 'Maternally Kate' section and 'Kate Loves'. William looked handsome and relaxed despite having to leave his lovely wife at home. I am hoping that Kate is feeling somewhat better since William was able to make the premiere. I LOVE that the audience gave a huge round of applause for Kate. There are many prayers being said by all for her and William and their precious baby. 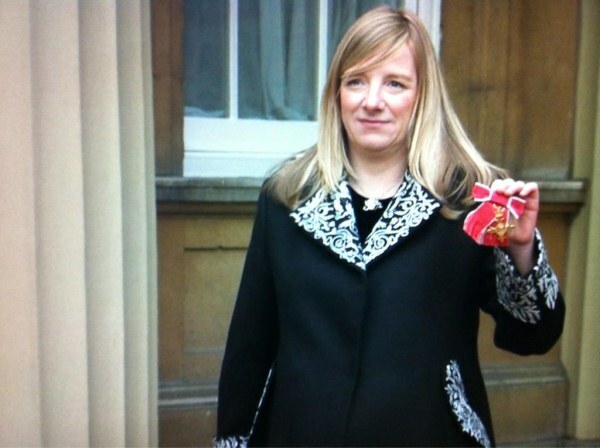 Congrats to Sarah Burton for her OBE award! I loved her coat she was wearing and have a feeling we will be seeing Kate in some of her maternity wear. I read an article where she had very kind comments about working with Kate creating her wedding dress. She said she was the picture of grace and beauty. Everything Kate seems to me to be! I really hope Kate will be at home with her parents in Bucklebury as William returns to work. Her family is such a great support to her and can be by her side if needed. Everyone knows no one can take care of you quite like mom can. Praying this will be a stress-free, relaxing holiday for them both. Selfishly, I would love to see Kate in beautiful Christmas attire out and about, but I know the most important thing is rest and taking care of herself and the baby. 2013 will be an exciting year for them! I'm sure Kate will spend a lot of time with her family while William is working in Anglesey, and understandably so. I believe she is his priority, but he does have responsibilities that require his time. In reality, this is nothing new for this couple. Hi royalfan- I agree with you that the Duchess is Williams priority but yes he has a duty to the RAF. I would think on his days off he will be by her side. I just hope & pray she get's to start feeling better. And I like the idea of them spending Christmas with her parents. She does not need the stress of a royal Christmas, having to make serval dress changes daily plus all the other activities that go along with the royal holiday. The Duchess just need's to be able to put her feet up and relax. She will get that with William & her parents. Pauline, I totally agree. In my opinion, William will never shy away from his duty, but he will always love and cherish his wife. Diana would be very proud of the man he has become, and the monarch has HER to thank for that. Thank you, Charlotte, for this update! Wishing you a great weekend and sending my thoughts and prayers for the families who were affected by that terrible shooting in Connecticut. Robin- I too can not believe what happened in Connecticut today. My daugther in law was a special education teacher for 7 years in California and everyday when she went to school I prayed that she would come home safe. And I have to worry about my grandson who in a few years will start school. What is this world coming to? When my boys were school age, I sent them off to school every morning and did not even worry that something like this would happen. This was in the late 1970's & 80's. When they started high school I put them in private school to keep them away from gangs. But now I am very glad they are grown men. I hope that the Duchess will start feeling better real soon so she can enjoy her pregnancy with her husband. I'd like to echo Ana's thoughts and words. I was deeply saddened to hear about today's unspeakable events in Connecticut. I didn't even hear about the shooting until tonight at a Christmas party. I was horrified. Sometimes I don't even want to listen to the news anymore. That is one reason this blog is more enjoyable. Don't want to live with my head in the sand but sometimes it is all to much. On a lighter note still looking at coats so looking forward to the coat post. Love the holiday decor Charlotte !! I hope William does what is best for him and Kate. He has a lot of weight on his shoulders now but really he has time because hopefully he will not be king for quit some time. It would be nice for Kate to stay with her parents for awhile. Charlotte. What where those 4 messeges above me about? Thank you so much Sarah! I've had over 30 spam comments since yesterday. It seems blogger is having issues with them at the moment.